Charlottesville, Va., Police Chief Retiring, As Fallout From 'Unite The Right' Rally : The Two-Way Accused by a stinging report of a "slow-footed response" to violence at the rally, and amid claims that he intimidated officers, Alfred Thomas is retiring. His deputy will take over as interim chief. 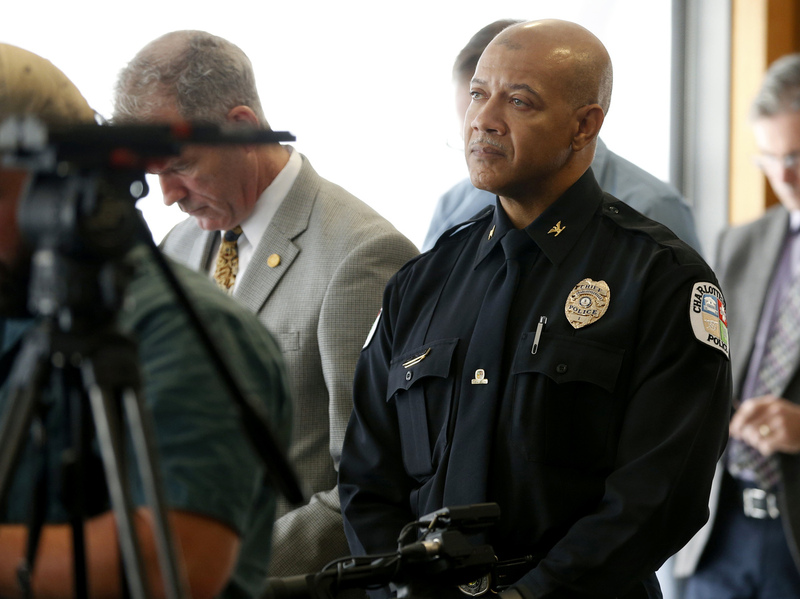 Charlottesville Police Chief Alfred Thomas listens earlier this month as an independent report on violence at a white supremacy rally is read at a news conference. Thomas announced his retirement Monday. Alfred Thomas, the Charlottesville, Va., police chief who faced an onslaught of national criticism over his department's handling of deadly violence at a white nationalist rally in August, announced his retirement Monday. In a statement, Thomas wrote, "I will be forever grateful for having had the opportunity to protect and serve a community I love so dearly." City officials said Thomas' departure would take effect immediately. They provided no explanation for the abrupt move by the law enforcement veteran. But Thomas had been under intense scrutiny for several months following the "Unite the Right" rally — a demonstration by a coalition of white nationalist, white supremacist and other so-called alt-right groups from across the country — that ended in violence and the death of 32-year-old Heather Heyer. She was struck by a car while counterprotesting. The bloody hit-and-run was captured on video and broadcast on news outlets for weeks. An independent report issued earlier this month was sharply critical of Thomas' leadership. The 220-page document found law enforcement and city officials made several significant mistakes on the day of the rally and in preceding months. It called Thomas' response to the escalating chaos "slow-footed." The report also said Thomas deleted text messages that were relevant to the independent investigation in the aftermath and created a climate wherein officers were made to feel fearful of retaliation for speaking with investigators. Thomas' attorney has denied the claims. Although he did not respond to any of the specific findings, Thomas released a statement saying, "My hope now is that, as we move forward ... we can learn from the productive elements of this report, work together to address our shortcomings and recommit ourselves to serving the public in a way that gives our citizens the utmost confidence in their safety and wellbeing." Thomas, who was appointed to lead the police department in April 2016, will be succeeded in the interim by Deputy Chief Gary Pleasants. The city will begin its search for a new chief immediately.